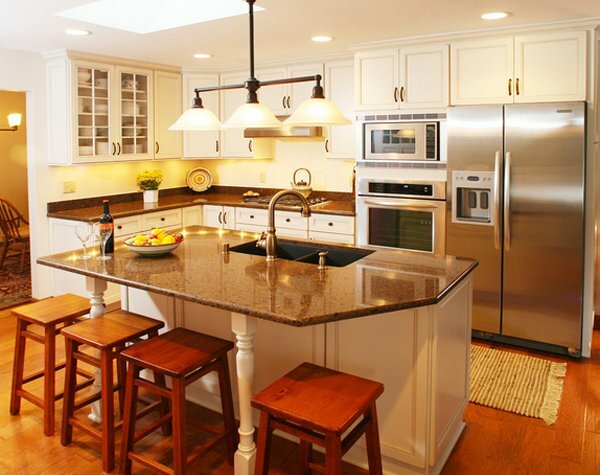 We all know that granite countertops are beautiful and durable, easy to clean, and basically resistant to heat and scratches. It’s vivid natural color palette and near diamond-hard surface makes it the ideal material for countertops. We are pretty sure that when you were planning your kitchen, granite was the one thing that you thought of for that cute kitchen you were going to add to your home. 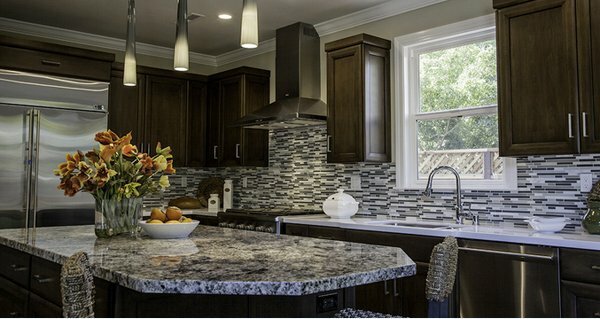 Granite has the widest selection from nature’s palette of colors, veins and patterns. 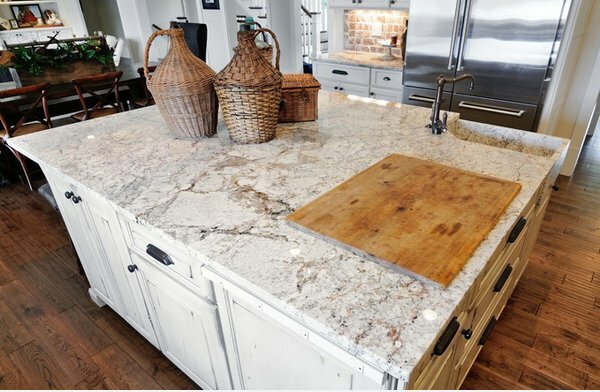 You can get samples online or check them out at your local stores when picking out the perfect countertop you can get for your home. 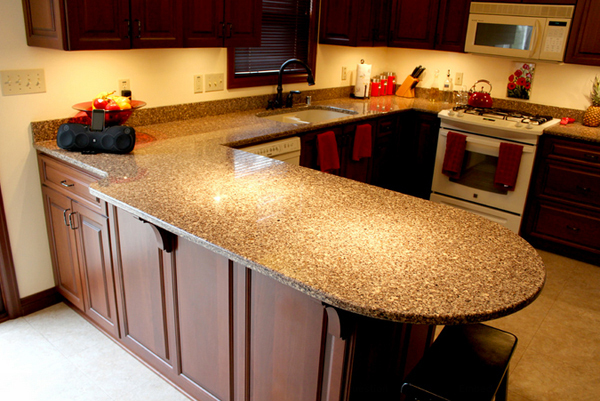 You can always add the best finishing touch to your kitchen countertop by adding the edge to fit your personality. 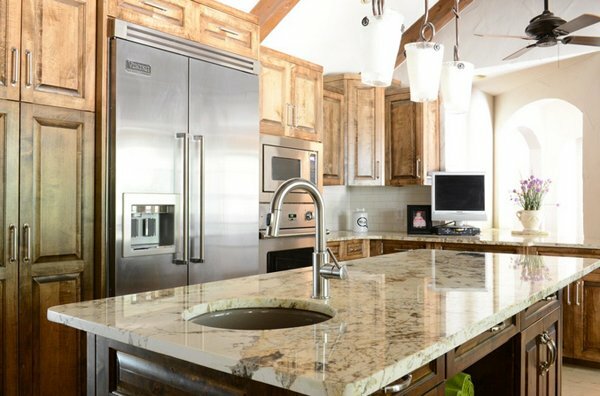 So, without further ado, here are your 15 Different Granite Kitchen Countertops. 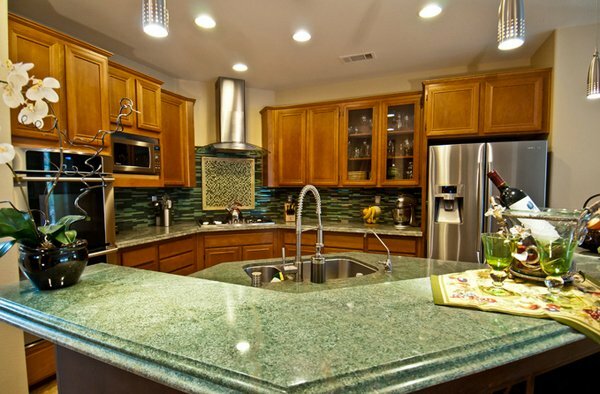 Alpinus granite on the kitchen countertop that contrasts with the cabinet just below it looks beautiful. The browns on the cabinets and the whites for the ceiling and the counter match really well. This Big Canoe home has an absolute black antiqued granite kitchen countertop that sort of looks grey in this picture but sure blends with the reddish brown cabinets and the grey stools. Blue Flower granite from Brazil is swirling dramatic blue durable slab granite with both light and darker veins. Blue Flower is recommended for both interior and exterior projects including countertops and landscaping in climates with freezing temperatures as well as all interior projects including backsplashes, flooring, and countertops. We know you notice the overhang which is a good place for storage and in this picture, adding plants made it look rather refreshing. The river white granite kitchen countertop is stunning, don’t you agree? Perfect idea for a small kitchen design! 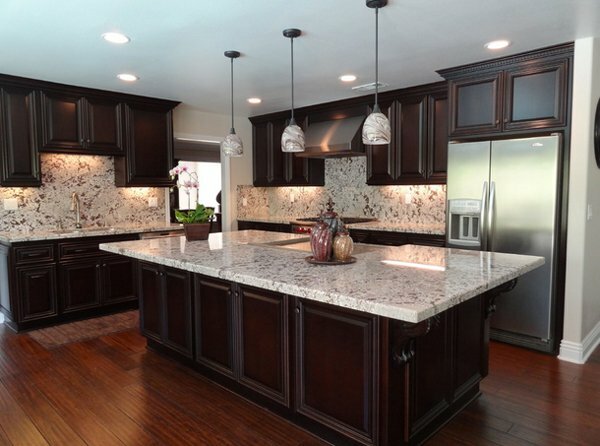 Dark wood cabinets pair nicely with granite countertops as you can see in this photo. 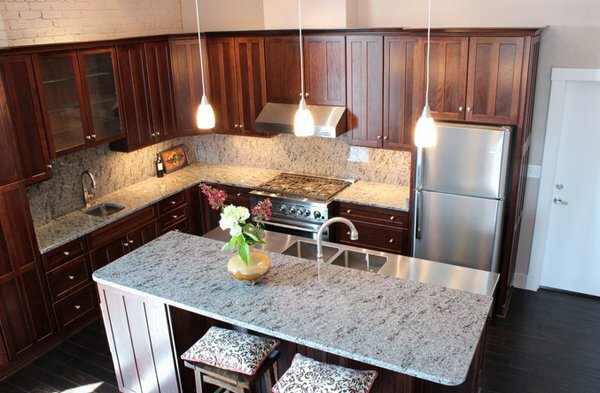 This Bianco Alaska granite kitchen countertop and backsplash installation made by Stone Studio is awesome. The contrasting color combination in this kitchen and the others make all the difference. Could you imagine this custom kitchen remodel in your home? 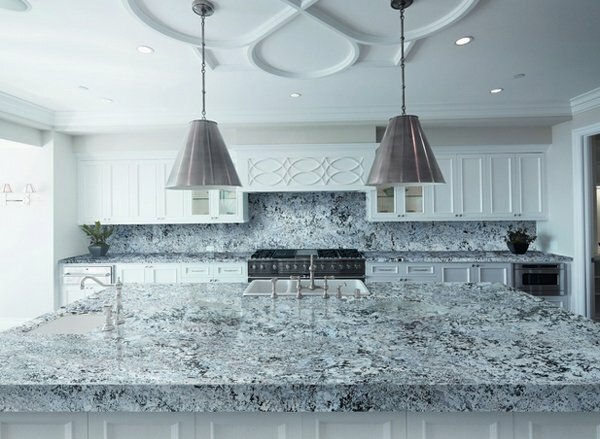 Well, if these granite kitchen countertops are what you’ve been looking for, you should really contact the designers because this is a definitely beautiful. The black and white cabinets match the color of the granite countertop; and the industrial chandelier makes a good conversation piece for this Mediterranean kitchen. This white spring granite countertop/island is out of this world! It’s gorgeous and really neat. Stands out with the reddish brown flooring. These contemporary white kitchen cabinets become more stylized paired with dark granite countertops and stainless steel appliances. Great idea for smaller kitchens! 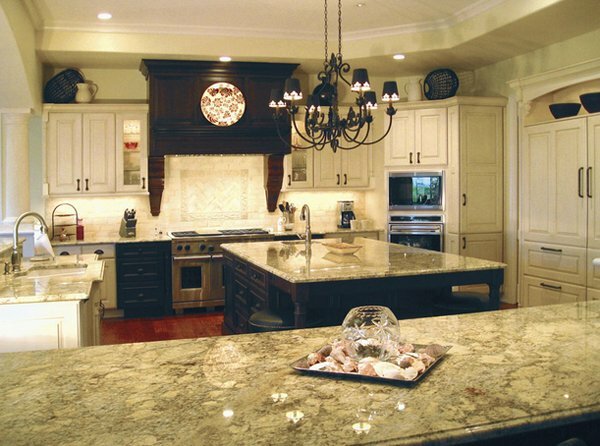 Sedan granite kitchen countertops and island is the perfect center piece for this traditional kitchen. This remodeled kitchen was part of a Richmond, VA project that converted an old Pie Factory into a residential building. Designed by David Garnett, this kitchen has both modern and transitional design features. The kitchen uses Merillat Masterpiece’s Landis door style in Hickory with a Kaffe finish. The countertops are Blue Eyes Granite. 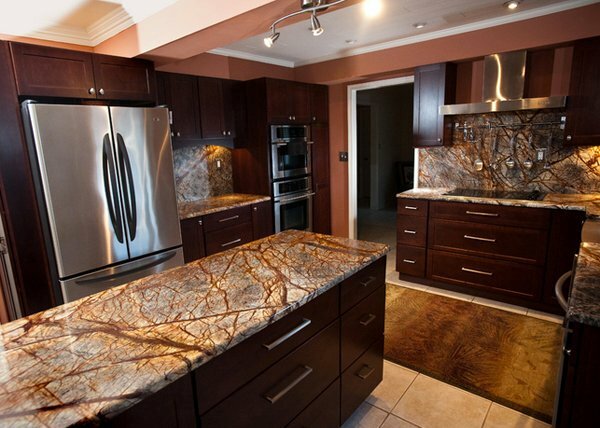 Rainforest Brown Granite is stunning, dramatic granite with varying shades of brown and grey. 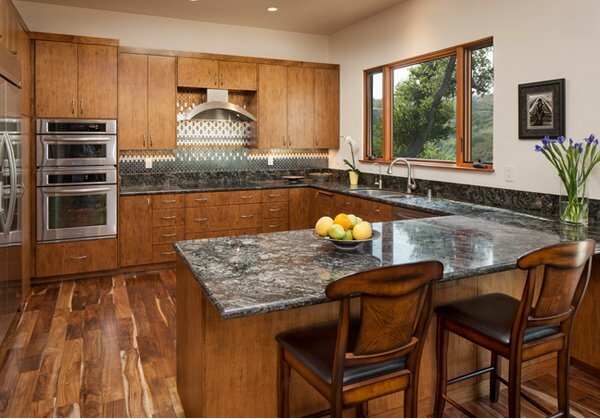 They balanced out the exuberant Rainforest Brown Granite with streamlined cabinetry and appliances. Cosmos granite kitchen countertops selected for their beauty, for the depth and interest of their “natural art” patterns and because the silver and copper throughout the stone tied in with the cabinets, wood floor, and stainless steel. Don’t you just think the decals above the range and on the ceiling just attractive? The pendant lights are definitely pretty above the Lennon granite kitchen countertop which simply blends with the colors in this kitchen. We are sure that without a doubt we all agree on the idea that countertops are a major deal when it comes to kitchen design and layout. You can always go for tiles or another material, but when you see how much prettier a kitchen is because of your granite countertop, you will never be the same. 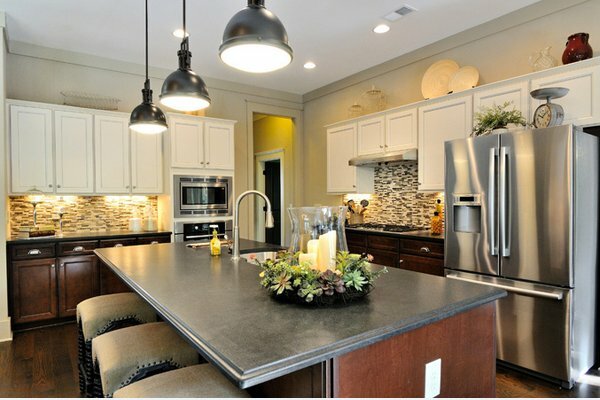 We like our 15 Different Granite Kitchen Countertops, and we hope you like it too! Also, check out the 15 Functional Kitchen Island with Sink and tell us what you think! it’s more attractive than a plain one but is it not too expenssive? I love the Dallas Kitchen. I agree with your statement that my personality towards designing my kitchen can be seen through how i choose the best things for my kitchen. 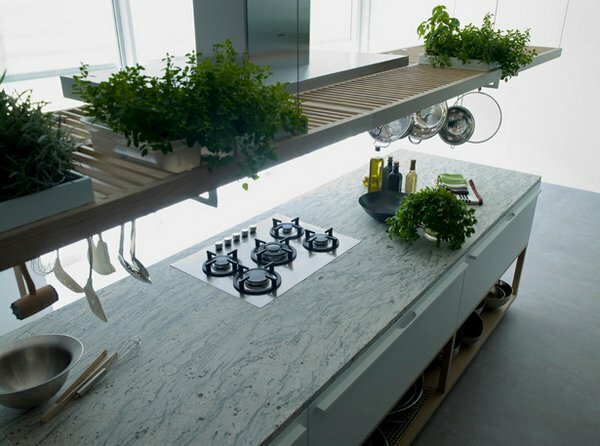 The most thing that I like using granite is the durability.I want a longer usage and attractive too! Awesome idea/suggestion..I’ll try to remodel our kitchen countertop. 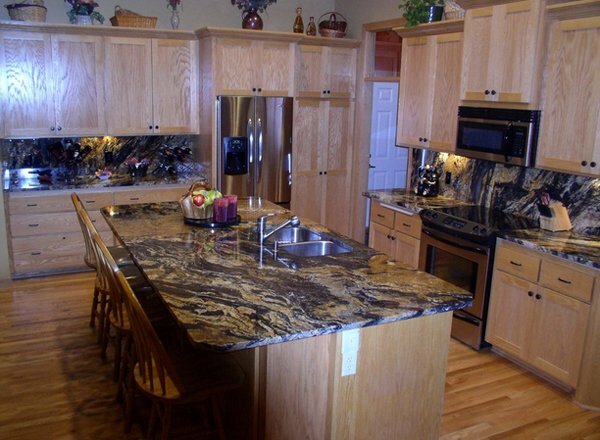 Granite countertop are very appealing..
I’m glad you featured this post today because were planning to renovate our home and 1 of our plans is to change the countertop of our kitchen..thanks for the idea. Glad this inspires you Joan :) You might want to check more on our Kitchen category.